Star Wars Used to be Uncool. Pinball Helped Bring it Back. This Star Wars pinball machine wasn't released in the 70s, or 80s. It was released in 1992, which makes it very special, because that makes it part of the great Star Wars renaissance. After the hype over the original trilogy died down after the mid-80s, as weird as it is to imagine now, Star Wars just kind of...faded away. It was, dare I say it, uncool. It took a concerted by Lucasfilm in the early 1990s to bring it back, spearheaded by quality video games (like Super Star Wars and X-Wing) and Timothy Zahn's wonderful "Thrawn Trilogy" of expanded universe novels. 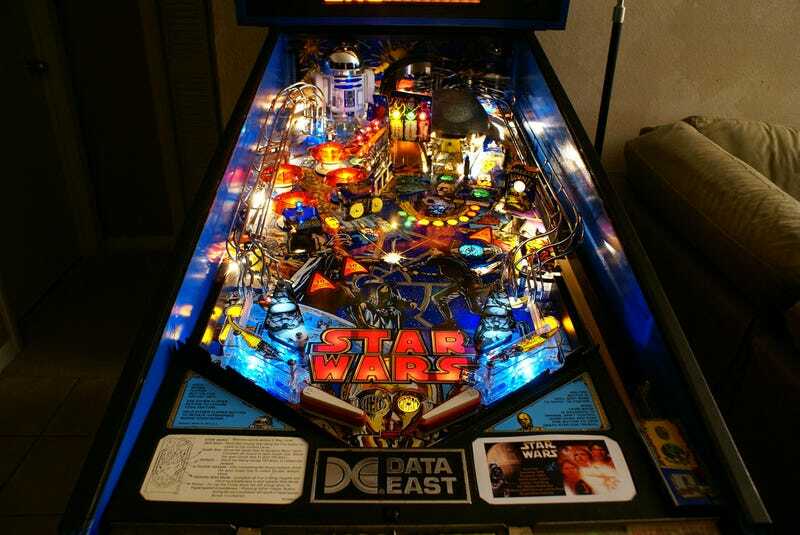 Data East's Star Wars pinball machine also played its part. And in these great photos by Eric Smith, you can get close enough to smell 1992 in all its glory.